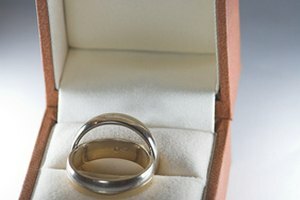 If you've inherited a treasure chest of jewelry you can't identify; if you've received jewelry and you don't know if it's real; if you want to sell your jewelry but don't know if it's valuable; if you're the type who researches all the facts before you buy; if you'll be buying and collecting jewelry at garage sales and antique stores as an investment - this guide is for you. Gather your tools. You will be using the magnifying glass or loupe to view the markings on the jewelry. On a ring, the marking is inside the shank. On a chain or bracelet, it's at the end on a piece called a tag, or on the clasp. On a pendant, it's on the bail, which is the part of the piece that the chain goes through, or it's on the back of the piece. On earrings, it's on the post, or on the back of the piece. Organize your jewelry by writing down the information you see on a piece of paper and placing it and the piece in one of the plastic bags. If you find another piece with the same markings, add it to the same bag. Doing this means you won't have to look at the markings a second time, and will save time if you have a large amount of jewelry to identify. Look at each piece for the following markings. Write down everything you see, such as initials, symbols, and names, not just the numbers. If you can't find anything at all, or just a number, it still may be genuine. I'll talk about that in step 7. The letter P behind a karat stamp means it's plumb gold, a designation once used to mean that 14K gold was actually 13.95 parts gold, not 13.50 parts. It doesn't mean it's plated. The marking isn't usually used today. In the United States, gold must be 10K or above to be called Gold. Identify non-gold items by using this list: GE means Gold Electroplate. HGE means Heavy Gold Electroplate. RGP means Rolled Gold Plate. GF means Gold Filled. GP means Gold Plated. Gold Overlay or Vermeil usually means Gold over Sterling. 1/10, 1/20 or any fraction before a karat marking means Gold Filled. Identify sterling silver by finding the number 925. Some items that appear to be gold but have the 925 stamp are made of gold-plated sterling silver. Identify Palladium by the marking PD. Look at what is stamped after the markings I listed above. 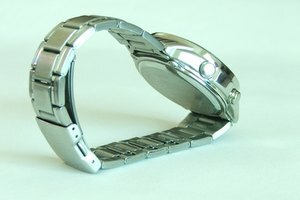 Initials, symbols, and names are the hallmarks or trademarks of the manufacturer. 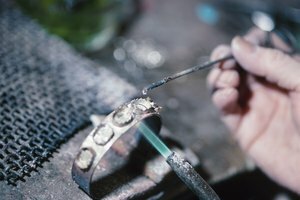 As of 1931, in the United States all jewelry pieces that are stamped with a karat marking must also be stamped with the manufacturer's trademark. If a ring has only a karat stamping, or none at all, it may be that it was made before 1931, be a foreign-made piece, or it was sized and all or part of the markings are gone. On a chain, if there's a karat stamp and a trademark on the clasp or tag, it may be that only the clasp is genuine, and it was added to a non-gold chain to fool someone. Take any pieces you're unsure of to a good jeweler. You may be charged a small fee for an ID service. Sometimes the jeweler can tell you if it's real just by feeling the heft of the piece or by examining it for plating or tarnishing. There's a gold-testing machine with an non-scratching probe that identifies karatage. Nitric acid, a dangerous chemical, may be used. Do not use this yourself. Unfortunately, a mark must be filed into the piece when acid is used, and it damages the value. Using nitric acid is a last resort. That's it! Now you know what you have, and you can buy or invest in jewelry with knowledge and confidence.